At O’Grady’s Landscape, we understand how critical proper fertilization is to maintaining beautiful turf and healthy shrubs and grasses. We pride ourselves on providing a reliable service our clients can always count on and our landscapers draw on years of experience to ensure the job gets done right, every time. And as your one-stop-shop for landscaping in Northern Virginia, you can trust us with all your lawn care needs so you won’t have to deal with multiple companies or worry about keeping up with regular maintenance yourself. Give your lawn and plantings the nutrients they’re missing—call us today at 703-533-5001 to schedule lawn fertilization in Great Falls, the City of Falls Church, North Arlington, Vienna, or McLean! 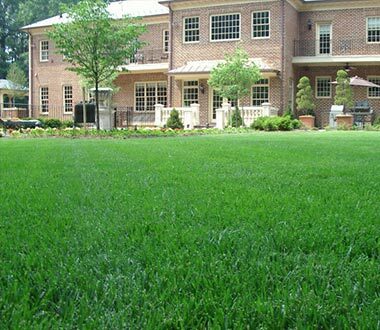 When it comes to turf fertilization in Northern Virginia, we recommend you schedule your service in fall and spring. With cool nights and warm days, these seasons typically provide optimal conditions for growth—and applying turf fertilizer during this time can give your lawn the extra help it needs to stay healthy year-round. Nitrogen promotes quicker growth and healthy, dark green leaves. Phosphorus encourages root growth, flowering, and increases the resistance to cold. Potassium increases strength and helps your plantings resist wind, ice, and disease. Iron allows the nutrients listed above to better access your turf and is especially ideal when you have certain plants that can be prone to deficiencies. Keep in mind as well that shrub fertilization is ideal for plants in the first five years of maturity and that smaller plantings will require more supplemental feeding than, say, larger trees. To find out more on how our Northern Virginia shrub fertilizer service could help you, give us a call today! Choosing an experienced landscape company in Northern Virginia can be critical to ensuring the fertilization process is effective and your plantings remain healthy. Improper fertilization techniques can lead to excess water, drowning your plantings and causing more harm than good. Fortunately, the experts at O’Grady’s Landscape offer a careful, thoughtful service to ensure the process is as thorough as possible and maximize the life expectancy of your turf and shrubs. So no matter what your needs may be for fertilization in Northern Virginia, know that you can always count on us to get the job done right. Contact us today at 703-533-5001 to schedule fertilization in Great Falls, North Arlington, the City of Falls Church, Vienna, or McLean and we’ll get back to you with an estimate fast!